Now on the Apple Watch! 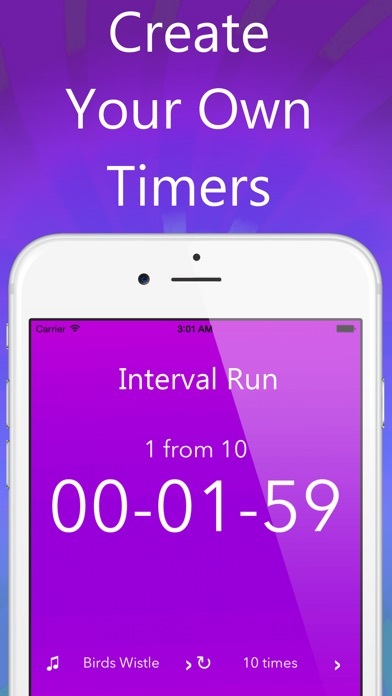 Easy to use timer app with large digits. 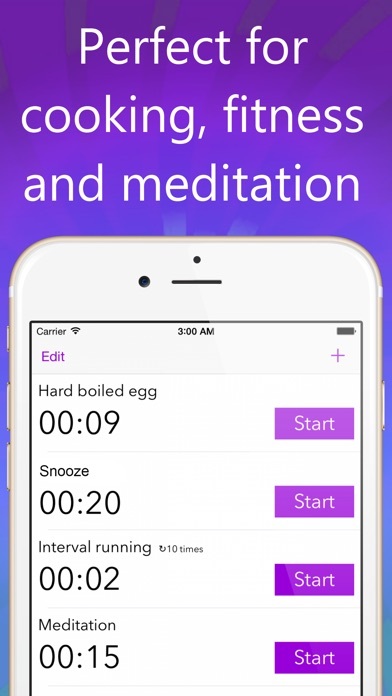 Create, label and reuse timers for anything – interval training, yoga stretches, baking, boiling eggs, steeping tea, cooking chicken, laundry, napping, ventilating the room, meditation, resting. One tap starts it. One tap pauses or stops it. Very simple. 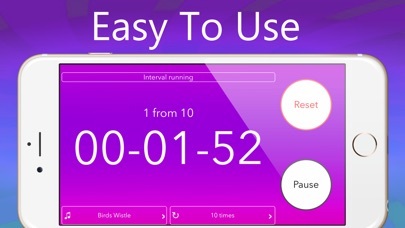 === Pros: === • Extremely easy to use • Large digits • Custom alert sounds for each timer • Beautiful, clean interface • Runs in the background so you’re free to use other apps • Times by the second • Minimum space on your device === Contact Us: === Questions? Ideas? Bugs? If you have any questions, found a bug or there's something you'd like to see in a future update, leave a review or send an email to mail@rsios.com === SUPPORT NOTE: === To hear the alarm if you have timers running when you aren't inside the timer or when your device is locked, make sure that your mute switch is set to OFF. This is a limitation of iOS local notifications. Also make sure that the notifications are enabled for the app. To enable notifications, go to Settings -> Notifications -> Timer -> Enable Notifications. I have tried this app a few times with the Apple Watch, and without a chime feature it is pretty useless. Sure it keeps time, but unless you watch it count down you wouldn't know your timed things were done because it does not chime. I have deleted and reloaded the app, still no chime. The point of a timer is to remind you with some kind of ding or vibration. If I wanted to watch the minute hand on my watch, then I would watch my minute hand. I intended to use this as a tea timer... But it is pretty much useless as a tool. I will find another timer that works with the watch. This one is not it.